Definition at line 54 of file llfloatergesture.h. Definition at line 82 of file llfloatergesture.cpp. References LLGestureManager::addObserver(), gGestureManager, sInstance, and sObserver. Definition at line 92 of file llfloatergesture.cpp. References gGestureManager, gSavedSettings, LLView::mRect, NULL, LLGestureManager::removeObserver(), LLControlGroup::setRect(), sInstance, and sObserver. Definition at line 213 of file llfloatergesture.cpp. References ADD_BOTTOM, LLPanel::childGetListInterface(), LLInventoryModel::getItem(), LLInventoryObject::getName(), gGestureManager, gInventory, KEY_NONE, list, LLGestureManager::mActive, MASK_ALT, MASK_CONTROL, MASK_SHIFT, LLCtrlSelectionInterface::OP_DELETE, and LLKeyboard::stringFromKey(). Definition at line 379 of file llfloatergesture.cpp. 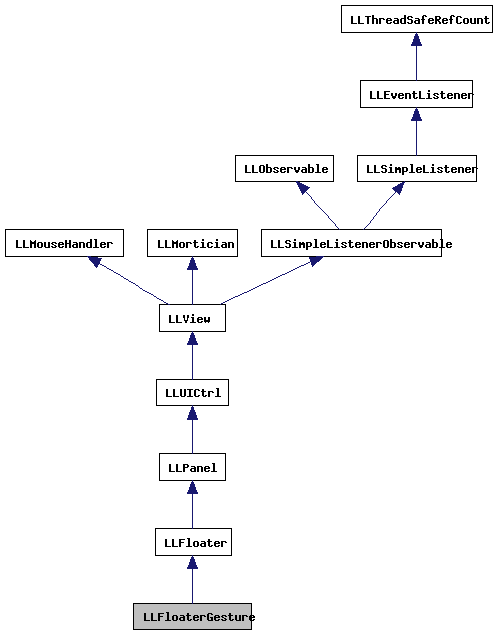 References LLFloaterView::findNeighboringPosition(), LLFloater::getHost(), LLInventoryModel::getItem(), LLInventoryObject::getName(), gFloaterView, gInventory, list, LLUUID::null, LLView::setRect(), and LLPreviewGesture::show(). Definition at line 319 of file llfloatergesture.cpp. References tut::inv(), list, LLInventoryView::showAgentInventory(), and TRUE. Definition at line 367 of file llfloatergesture.cpp. References LLAssetType::AT_GESTURE, create_inventory_item(), gAgent, LLAgent::getID(), LLAgent::getSessionID(), LLInventoryType::IT_GESTURE, NOT_WEARABLE, LLUUID::null, PERM_MOVE, PERM_TRANSFER, and LLTransactionID::tnull. Definition at line 333 of file llfloatergesture.cpp. References gGestureManager, LLGestureManager::isGesturePlaying(), list, LLGestureManager::playGesture(), and LLGestureManager::stopGesture(). Definition at line 401 of file llfloatergesture.cpp. Referenced by postBuild(), refreshAll(), and show(). Definition at line 106 of file llfloatergesture.cpp. References LLPanel::childSetAction(), LLPanel::childSetCommitCallback(), LLPanel::childSetDoubleClickCallback(), LLPanel::childSetVisible(), LLFloater::getTitle(), onClickEdit(), onClickInventory(), onClickNew(), onClickPlay(), onCommitList(), LLPanel::setDefaultBtn(), LLFloater::setTitle(), and TRUE. Definition at line 182 of file llfloatergesture.cpp. References buildGestureList(), LLPanel::childGetListInterface(), LLPanel::childGetScrollInterface(), LLUUID::isNull(), list, mSelectedID, NULL, onCommitList(), LLCtrlScrollInterface::scrollToShowSelected(), and sInstance. Referenced by LLFloaterGestureObserver::changed(), and LLGestureInventoryFetchObserver::done(). Definition at line 136 of file llfloatergesture.cpp. References LLUICtrlFactory::buildFloater(), LLRectBase< Type >::getHeight(), LLControlGroup::getRect(), LLRectBase< Type >::getWidth(), gSavedSettings, gUICtrlFactory, list, LLFloaterGesture(), NULL, LLUUID::null, onCommitList(), LLFloater::open(), and sInstance. Definition at line 169 of file llfloatergesture.cpp. Definition at line 79 of file llfloatergesture.h. Definition at line 81 of file llfloatergesture.h. Referenced by LLFloaterGesture(), refreshAll(), show(), toggleVisibility(), and ~LLFloaterGesture(). Definition at line 83 of file llfloatergesture.h. Definition at line 82 of file llfloatergesture.h. Referenced by LLFloaterGesture(), and ~LLFloaterGesture().